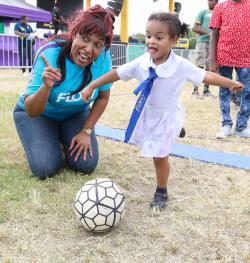 As Jamaicans get ready for football fever, telecommunications firm Flow, has announced plans to heighten the experience in several rural town centres and communities across the island starting on June 15. The Flow Ball & Blaze Road Tour kicks off this Friday in Ocho Rios with the mounting of a large screen in the busy town centre to stage a TVJ ‘World Cup’ Watch event for spectators who wish to see Portugal take on Spain at 1:00 p.m. There will also be entertainment and giveaways for passers-by. The first instalment of the tour then continues on Sunday, June 17 with reggae crooner, Romaine Virgo booked to headline a massive community party at the Buckfield Football field in Ocho Rios, St. Ann. The event will feature another TVJ ‘World Cup’ Watch event - the Brazil vs. Switzerland fixture starting at 1:00 p.m, Other activities include six-a-side competitions as well as giveaways and other family entertainment to complete the package from Flow. Kim Lee, Head of Retail & TV Marketing at Flow, shared that the company is “all in” as broadcast sponsors of the TVJ 2018 FIFA World Cup TM which kicks off in Russia on June 14. “We are pulling out all the stops to ensure that our customers and all Jamaicans can enjoy the “greatest show on earth “in fine style. This spans our broadcast sponsorship with the number one national broadcaster, TVJ, to provide world class coverage, special bundled packages and now, an exciting community series that will make the highly anticipated event even more special in several rural areas across the island, Lee highlights. Last month, the telecommunications firm announced that it will be partnering with TVJ to launch a 24-hour channel (Ch. 111) that will offer both live and delayed games, inclusive of TVJ’s world class analysis in its renown pre- and post-game shows leading up to and throughout “the greatest show on earth”. This, Lee says, will use Flow’s TV platform to expand the reach and viewership throughout the four-week tournament. “Together, we will show more football in more areas of Jamaica than was ever previously possible,” she further highlighted.